The Board reviewed the District Strategic Action Plan Monday night, examining the goal, objectives and indicators that will measure success. The Strategic Action Plan if focused on one goal: Increasing student achievement. District administrators reviewed the strategies and actions needed to meet the plan goal, describing the work as “reasonable, attainable and aggressive”. The Board also reviewed a calendar for reporting on progress under different areas of the plan, including a community-wide report on progress each October. The Strategic Plan was incorporated into Policy 100 of the Board policies, which outline district philosophy, mission, beliefs and expectations. The new package changes from a two-tier wage schedule to a 5-step program based on labor grade and years of service. The new package increase will cost the district about $68,000, which represents a 3.01 percent increase. The settlement will cover July 1, 2012 through June 30, 2014. The district currently employs 47 buildings and grounds employees. A group of high school and middle school art students will be spending a day in Chicago March 24. The Board approved plans for a trip to visit the Chicago Art Institute Museum and the Art Museum at Northwestern University. A total of 34 high school students, eight middle school students and 12 adult chaperones will attend. Art Club fundraising proceeds are helping to defray some of the costs. This evening, the Board of Education heard an administrative report about the district’s Strategic Action Plan. Board members then completed the First Reading of Policy 100: District Philosophy, Mission, Beliefs, and Expectations. Throughout tonight’s discussion, the Board conveyed a commitment to ensuring all students receive a high quality education in a compassionate and engaging environment of high expectations and accountability. I look forward to reporting the progress our students will make over the next several years – and to celebrating the success that will result from the work of dedicated students, parents and staff. The Marshalltown Community School Administration has been working hard to update the 1994 District Philosophy, Mission, Belief, and Expectations policy. This comes at a time where the strategic agenda has been defined as the “road map” towards meeting the goal of the district, which is “To increase student achievement”. Every decision made within the district has to answer the question, “Will this increase student achievement”? If it doesn’t then we shouldn’t be doing it! Whether at the board, administrative, building, maintenance, or support services level we, as an organization, will continually ask ourselves to relate all decisions back to our goal in the strategic agenda. Policy 100 will be a fundamental tool to engage all staff, teachers, students, and administrators towards a common goal. Decisions made throughout each department will be expected to correspond with one of three objectives: improvement of academic performance, increase readiness for further education or employment, or to ensure that our schools are safe and organized to promote student achievement. At the beginning of every board meeting the district’s mission statement is read; “To nurture students to become intellectually and personally empowered for citizenship in a changing world”. I believe the strategic action plan will give district employees, students, parents, business leaders, and community members the opportunity to embrace the changes that will come through the numerous actions steps and ultimately lead MCSD towards becoming central Iowa’s district of choice. Vance Turner, MHS vocational skills teacher, effective at the end of the 2011-2012 school year. Has taught in district for 11 years. Amy Stepec, Lenihan Grade 5, effective at the end of the 2011-2012 school year. Has taught in district for 6 years. Disa Benefield, Franklin Grade 3, effective at the end of the 2011-2012 school year. Has taught in district for 7.5 years. Todd Reed, 8th Grade Boys Basketball Coach, effective Feb. 17, 2012. Melissa Seltman, Fisher LI Tutor, effective Jan. 19, 2012. William Bucklin, Bus Driver, effective Feb. 29, 2012. David Case, 7th Grade Boys Track Coach, effective Jan. 15, 2012. Nicole Jones, Lenihan paraeducator, effective Feb. 23, 2012. Betty Hayek, Rogers School Nurse, effective at the end of the 2011-2012 school year; has been employed with district for 15 years. Nancy Klar, administrative assistant to Associate Superintendent, effective June 30, 2012; has worked for MCSD for 34 years. Kathryn Elsberry, administrative assistant at Lenihan Intermediate, effective June 30, 2012; has worked for MCSD for 20 years. Rod Hassler, substitute bus driver. Start date: Feb. 2, 2012. Salary determined by route. Sue Crawford, Lenihan LI Tutor. Start date: Feb. 21, 2012. Change from 6 hours/day to 7 hours/day. Pamela Sowers, Lenihan LI Tutor. Start date: Feb. 21, 2012. Change from 4 hours/day to 7 hours/day. 100, District Philosophy, Mission, Beliefs, and Expectations will return as a Second Reading; 100.2, Equal Educational Opportunity, waive second reading; 101.1, Long-Range Needs Assessment, will return as a First Reading. Olivia Stone (left) shares her essay with the Board. Her teacher is Leah Mattox (right). 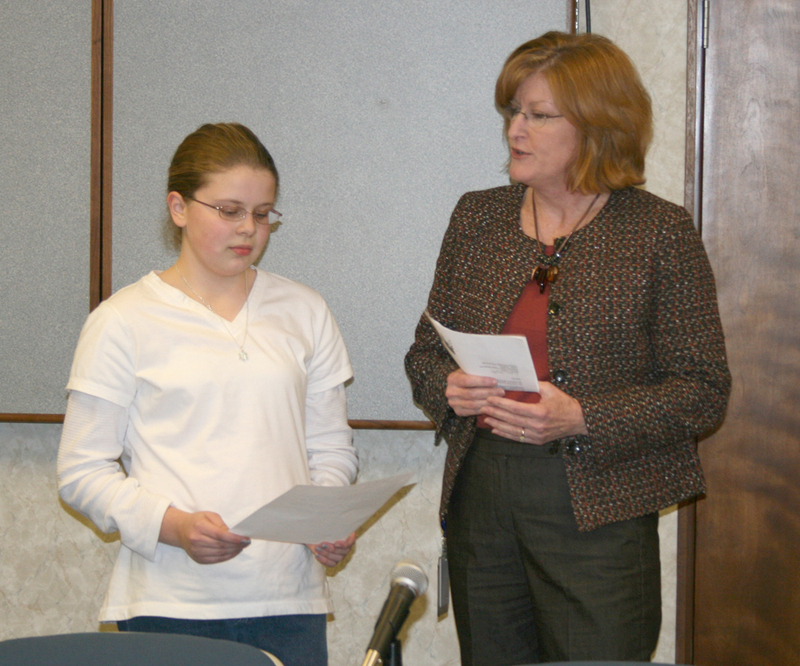 Olivia Stone, fifth grade student at Lenihan Intermediate, shared her award-winning essay with the Board Monday night. Stone wrote an essay in Leah Mattox’s class about old worn Army boots as symbols of bravery and freedom. Her essay won the VFW Elementary Essay Contest. She will be recognized by the VFW on Feb. 21. Marshalltown High School students are once again eligible for the Jean Seberg Drama Award, thanks to the Orpheum Theater Center and the MHS Class of 1956. The Seberg Drama Award was originally established in 1958 and given to a student active all four years in the “Masque and Dagger” drama club directed by Carol Haughton. Award winners had their names on a brass plaque in the auditorium lobby and a $250 monetary prize. Pip Gordon, director of the Orpheum Theater Center, said money from the Orpheum and a matching gift from the MHS Class of 1956 will re-establish the award, which will continue to be awarded “as long as there is a Jean Seberg Film Festival”. The Board approved three-year contract agreements with bus drivers and food service personnel Monday night. The agreement with bus drivers included a change to an 8-step salary scale to recognize longevity, as well as an average of 3 percent annual salary increase each year over the next three years. The food service contract adds one additional step to the pay scale and provides increases of 2.1 percent in year one, 2.0 percent in year two and 2.25 percent in year three. The contract also abolishes a previous uniform allowance. District attorney Rex Ryden said this also averaged to a total 3.0-3.1 percent increase over 3 years. There are 65 food service personnel and 45 bus drivers in Marshalltown Schools. The food service contract represents a $28,000/year increase. The bus driver contract is $20,000/year. The Board approved paying 60 percent of the cost to install vinyl composition flooring in the second story high school addition, with the contractor covering the remaining 40 percent. The floor was originally to be polished concrete, which was an additional $27,750 over the base bid. The finished product, while structurally sound, was not aesthetically acceptable because of excessive shrinkage cracks. Board members agreed that the appearance of the floor was unacceptable. On future projects when various options are presented they asked that potential risks (like the cracking) are made clear before projects are started. Tonight Physical Education Teacher and Coach Don Wiser introduced to the Board his “Classroom Exercise CD”, a research based approach that is intended to increase student engagement using fitness. Mr. Wiser was even brave enough to demonstrate a set of exercises to one of the songs. Each exercise program takes approximately 2-2 ½ minutes and is designed for students to do the exercises next to their desk. The CD has 14 songs in all with instructional voice over six songs and three slower songs to be used for relaxation, stretching or calming purposes. This inspirational product is not to replace gym time but is designed to increase student’s heart rates after they sit for long periods of time; to me it sounds like a great idea between ITBS tests or after a long Board meetings! According to researchers from the University of Illinois, students who have short exercise programs within daily instruction perform better on tests and pay attention in class better. Researchers have seen a strong correlation between fitness and reading comprehension with some students increasing a full grade level after they had exercised (ASCD In-service, 2009). Mr. Wiser reports at least 45 K-4 grade teachers in the district already use his CD Exercise program, commenting that the teachers who use the exercise CD have told him they do see an increase in their children’s academic engagement, especially when outdoor recess is not an option. They also have commented on the impact the relaxing songs on the CD have when students need to re-engage into subject matter. This fitness creation, again, shows how MCSD has creative teachers who are willing to think beyond routine for the betterment of Marshalltown’s youth. This evening, the Board of Education approved three-year settlement agreements with transportation and food service employees that include longevity pay adjustments. The Board also approved a new policy: Twelve-Month Secretary Voluntary Retirement Incentive Program (policy 413.7). I encourage any 12-month secretary who is contemplating retirement to closely examine policy 413.7. It can be found by going to the District website (www.marshalltown.k12.ia.us) and selecting the “School Board” tab on the right. Near the bottom of the Board of Directors screen is a section called “Board Policy.” Policy 413.7 can be found by clicking on the “400 Series – Personnel” link. I appreciate the Board’s continued commitment to attracting, retaining – and compensating – high-quality staff in our district. This commitment was once again demonstrated by tonight’s approval of settlement agreements and the new voluntary retirement policy. Margaret Catron, bus monitor, effective Nov. 7, 2011. Tom Carlson, bus driver, effective Feb. 3, 2012. Alison Brezina, bus driver, effective Jan. 27, 2012. Martha Landmark, Woodbury paraeducator, effective Feb. 2, 2012. Danielle Lamb, MHS paraeducator, effective Dec. 18, 2011. Jerry Appel, MHS varsity boys golf coach, effective Jan. 4, 2012. Ellen Slifer, Lenihan food service, effective Dec. 30, 2011; has worked for food service approximately 19 1/2 years. Melissa Seltman, Fisher Grade 3 teacher. Start date: Feb. 7, 2012. Salary: BA Step 5. Mahlon Maxwell, Franklin paraeducator. Start date: Feb. 7, 2012. Salary: $8.47/hour. Kelley Dickey, MHS assistant girls golf coach. Start date: Feb. 7, 2012. Salary: $1,914/year. Jeffrey Lamb, MHS head softball coach. Start date: Feb. 7, 2012. Salary: $5,024/year. Joshua Menuey, MHS assistant boys soccer coach. Start date: Feb. 7, 2012. Salary: $3,190/year. Ginna Randall, Anson Grade 1 teacher. Start date: 2012-2013 school year. Change from Grade 1 to Grade 2. Julie Thede, Anson Kindergarten. Start date: 2012-2013 school year. Change from kindergarten to Grade 1. Cedra Baccam, MHS paraeducator. Start date: Dec. 5, 2011. Change from 5.5 hours to 6.0 hours on Wednesdays. Deena Chedester, MHS paraeducator. Start date: Dec. 5, 2011. Change from 6.5 hours to 7.0 hours on Wednesdays. John Saunders, bus driver. Start date: Jan. 30, 2012. Change from substitute bus driver to regular bus driver. Salary: $4,252/remainder of 2011-2012 school year. 100 District Philosophy, Mission, Beliefs and Expectations, change some of the wording to specifically reference Strategic Action Plan; 100.1 Name of School District, mark reviewed; 100.2 Equal Educational Opportunity, changed “employment” to “educational activities”.